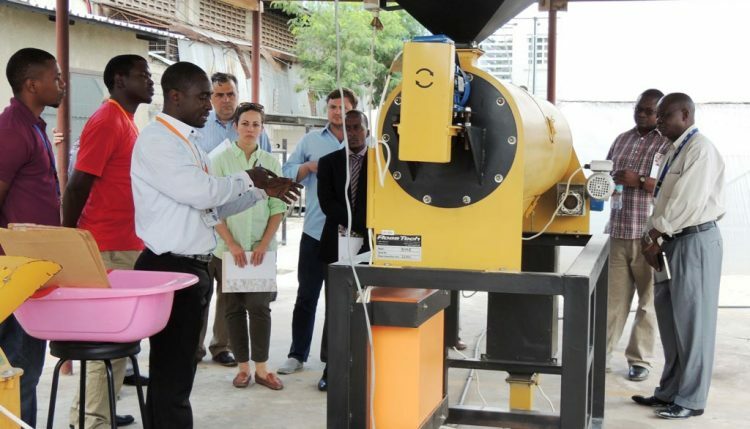 Visiting staff from the United States Senate, Washington, D.C., have applauded efforts by IITA to tackle aflatoxin contamination in key staple crops in Tanzania. Aflatoxin is a poison produced by some naturally occurring species of the fungus, Aspergillus that renders crops unfit for human and livestock consumption and reduces their sale value. IITA staff demonstrate to the visiting team the production of AflasafeTZ at IITA-EA hub in Tanzania. When consumed, aflatoxins cause serious negative health consequences including death in cases of extreme poisoning. Tanzania is reeling from the recent death of 14 people and scores of others falling gravely ill after consuming contaminated maize. The US Senate staff, who were accompanied by staff from the United States Department of Agriculture (USDA), Washington, D,C, and from the US missions in Kenya and Tanzania, visited IITA at its Eastern Africa hub in Dar es Salaam, Tanzania, while on a tour of projects funded by USAID and USDA in the country. Speaking during the visit, Tracy McCracken, the Sanitary and Phytosanitary Measures (SPS) Advisor at the USAID Regional office in Nairobi, Kenya, praised the efforts by the Institute in addressing agricultural challenges and in particular for transferring to Africa, Aflasafe, the biocontrol technology developed in the USA to prevent aflatoxin poisoning. She further promised to work with IITA and partners including the Tanzanian government for continued support of the development and registration of Aflasafe. During the visit, the team was warmly welcomed by the staff at the hub led by its director, Victor Manyong. Manyong highlighted the many projects being executed at the IITA-East Africa hub funded by USAID and took the opportunity to thank the US government for their support over the years. He particularly highlighted work on aflatoxins, its dangers to health, especially for infants during the first 1000 days, and on trade. “There are millions of children within the East African region that are being affected by aflatoxin poisoning. The impacts are underestimated because people cannot see, smell, or taste the poison,” he said. George Mahuku, a plant pathologist at the hub and who is heading the efforts to control aflatoxins, made a presentation on IITA’s progress in developing a biocontrol product to control aflatoxin and gave feedback on his visit to the two districts in Central Tanzania, where the recent cases of aflatoxicosis had occurred. He said IITA started work on aflatoxin control in Tanzania in 2012 with surveys to establish the prevalence and levels of aflatoxins in maize and groundnut. The team also collected samples to isolate and develop atoxigenic strains of Aspergillus flavus, to be used as candidates for biological control of aflatoxins. These surveys, he said, showed that aflatoxin contamination was prevalent in both maize and groundnut with more than 90% of the samples collected having detectable aflatoxin. Levels as high as 1,080 ppb of aflatoxin were obtained in some samples. In addition, this work revealed that on average, 80% of Tanzanians were not aware of aflatoxin, its health impacts, or ways to minimize contamination. “Thanks to these earlier work which was supported by USDA-FAS (the Foreign Agricultural Service), and USAID, with strong collaboration with USDA-ARS (Agriculture Research Service) and the government of Tanzania, we now have developed a biocontrol product for Tanzania called Aflasafe TZ. This product is now being tested in farmers’ fields to assess its efficacy to minimize aflatoxin contamination,” Mahuku said. 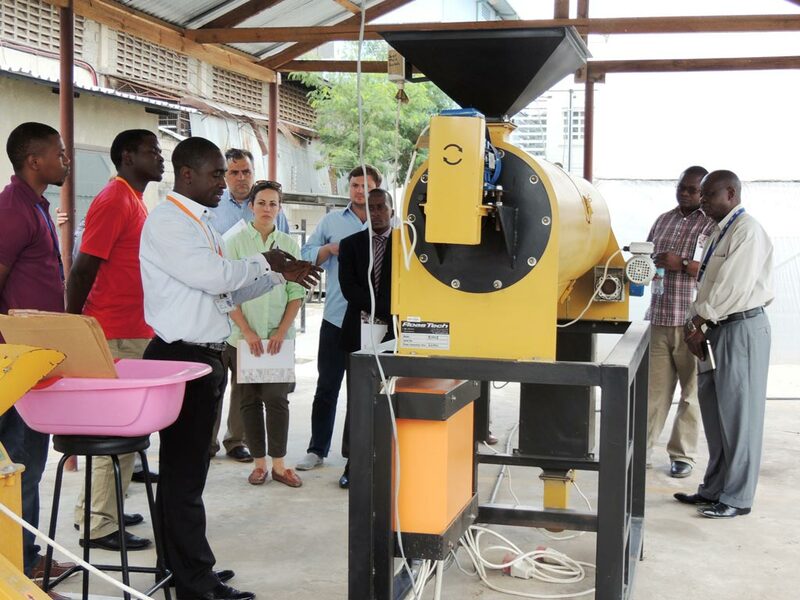 The group also toured IITA lab facilities for a demonstration on the production of Aflasafe TZ and the ongoing work to identify the cause of the acute aflatoxicosis that happened in Kondoa and Chemba districts in Dodoma Region.